The debate within International Relations between liberals and realists on economic interdependence and war is still largely unresolved, both theoretically and empiri- cally. This thesis provides a simple formal model to highlight the problems of the liberal argument that war is less likely due to the future loss of trade. 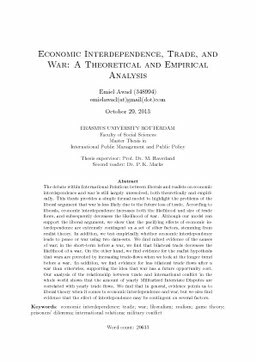 According to liberals, economic interdependence increases both the likelihood and size of trade flows, and subsequently decreases the likelihood of war. Although our model can support the liberal argument, we show that the pacifying effects of economic in- terdependence are extremely contingent on a set of other factors, stemming from realist theory. In addition, we test empirically whether economic interdependence leads to peace or war using two data-sets. We find mixed evidence of the causes of war; in the short-term before a war, we find that bilateral trade decreases the likelihood of a war. On the other hand, we find evidence for the realist hypothesis that wars are preceded by increasing trade-flows when we look at the longer trend before a war. In addition, we find evidence for less bilateral trade flows after a war than otherwise, supporting the idea that war has a future opportunity cost. Our analysis of the relationship between trade and international conflict in the whole world shows that the amount of yearly Militarized Interstate Disputes are correlated with yearly trade flows. We find that in general, evidence points us to liberal theory when it comes to economic interdependence and war, but we also find evidence that the effect of interdependence may be contingent on several factors. Thesis Advisor Haverland, Prof.Dr. M.